This summer I attended the first mass in the Swedish Lutheran Church in years. After some beautiful singing in a gorgeous and spacious church, the minister came in, a middle-aged man in a white beard. He greeted everyone and then he asked: “How come the Church so often enter the room with it’s behind first? a bare behind?” At this moment my guard of resistance to the mass, to the service was dropped, there was something different, something so kind and open in this minister and service. He recognized and acknowledged the Church dogma and unskillfulness. In that moment there was healing in my spiritual ancestral heart. In the collective heart of all assembled it felt like a sigh of relief, here we are safe, here we are seen and cared for. As a young child I was thrilled to hear stories from the Old Testament and felt both connected to and moved by the life of Jesus. I still do. The experiences I have had in Church has offered something very different. It’s like the message that was offered was something like: life is to endure, work hard to make penance and there is no way out, until death, maybe.” Toward the end of the mass we all got to turn around to offer peace and presence to the people around us in the pews. Experiencing the openness, joy and care during this mass, offers me much confidence that we can all find ways to come together in a way that the preciousness and wonder of life is present. When we can let go of all or at least some of our worries, concerns, judgements and comparisons, the present moment starts to reveal itself. We are more collected and centered. We are more together within ourselves and with the people around us, this is awakening in itself. This is a moment of partial awakening to non-self, to interbeing. In this moment there is healing taking place, individually and collectively. In my practice and study, I am most interested to look into what are the wounds in me and in the collective which limits our peace, love and freedom. Recognizing and taking care of this pain and blockage is necessary for healing and thus awakening to take place. The theme for this tour inspires me especially now when it can be easy to be overwhelmed with the troubles and complexities of our society and the world. More than ever do I sense the importance to offer ourselves to the path Mahatma Gandhi offered us: be the change you want to see in the world. We cannot do this as individuals, because separation and conflict is perpetuating the troubles we are in. As we practice walking meditation in nature we can heal our separation from the Earth. As we eat together we can come to see all of humanity as our family. As we consume less and enjoy a plant based diet our solidarity for those less fortunate can deepen. As we practice the Five Mindfulness Trainings and Noble Silence we can mature in our practice of peace and non-harming. What a wonderful way to spend a week. I hope you can join us. With many experienced practitioners and many newcomers, we can inspire each other to fully live and practice during the retreat, in this way we Awaken Together and Heal our Ancestral Heart. This healing will ripple much further than the retreat center. Thay Phap Ho, was born and raised in Sweden, where he studied at the university and worked for a couple of years, before he decided to look more deeply into how he wanted to life his life. This question led him to Plum Village where he ordained as a monk in 2003. He was ordained as a Dharma Teacher by his Teacher, Thich Nhat Hanh in 2010. 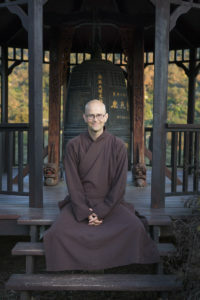 For the last 12 years he has lived and practiced at Deer Park Monastery in California. He offered a talk this past spring during the Wake Up Retreat: Love Yourself and Heal the World. Join Thay Phap Ho on the Awakening Together Tour this fall with the monastics of Plum Village, Blue Cliff, Magnolia Grove, and Deer Park.